This is the putter that won Charl Schwartzel the 2011 Masters. Well, not this exact putter -- Charl still has that one -- but this same model. If you missed it, let me get you caught up. All Charl did was manage to birdie the last five holes in a tournament that was probably the most competitive Masters ever with as many as ten guys within a stroke vying for that coveted green jacket. Charl rolled in putt after putt like he was playing a round of golf with his buddies on his home course. I think the most amazing one was on 17 after two of the Australians, Adam Scott and rookie Jason Day, applied the pressure by rolling in birdies while he stood in the fairway and watched. Charl answered by hitting an iron to 15-20 feet and then pouring in the putt like it was a 2-foot kick in to take a one-stroke lead to 18. 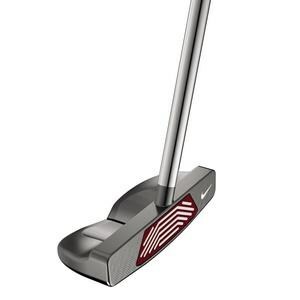 The feel of this Method Core 4 putter, like all of the Nike Core putters, is second to none. It's made with a soft polymer blended with milled steel grooves which are designed to give the golf ball a fast controlled forward roll at impact and eliminating any skipping and hopping.